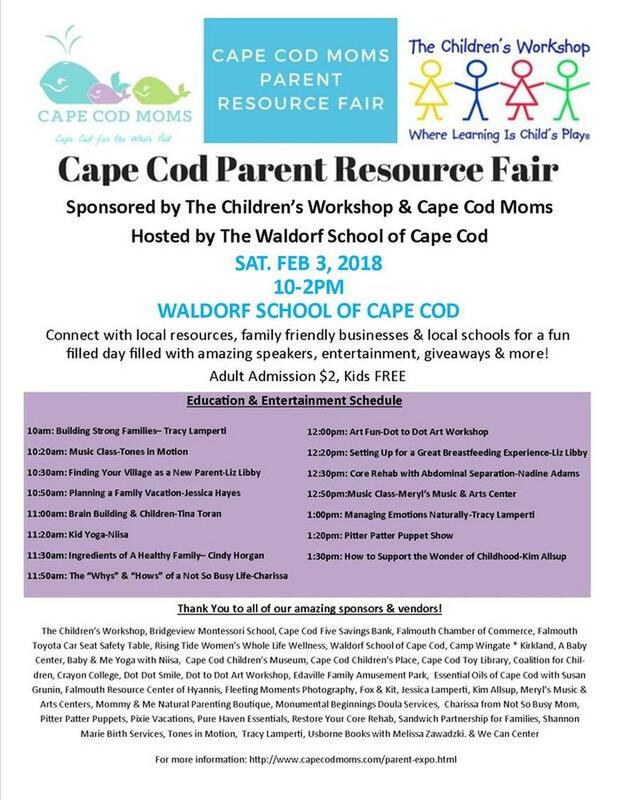 Cape Cod Moms, the region’s premiere online resource for parents, held the first Cape Cod Parents Resource Fair on Saturday, February 3, 2018 from 10:00 AM – 2:00 PM at The Waldorf School of Cape Cod. The event was a huge success with over 200 people in attendance. All parents, caregivers and children enjoyed this educational and fun resource fair sponsored by The Children’s Workshop. Attendees connected with local family-friendly nonprofit organizations, resource providers and businesses that are dedicated to helping families in our community grow and prosper. The event featured informative parent-focused sessions for adults led by area professionals along with fun and engaging entertainment for the whole family including music, art, yoga and even a dance class! Special thanks to the additional top sponsors: The Waldorf School of Cape Cod, Bridgeview Montessori School, Cape Cod Five Savings Bank, Falmouth Chamber of Commerce, Falmouth Toyota, Rising Tide Whole Life Wellness, & Camp Wingate * Kirkland. Be sure to check out our 2018 Event Program for lots of great information and resources! We were very thankful to have an amazing lineup of guest speakers at the 2018 Parent Expo. There was a rotating schedule of speakers throughout the day who shared their expertise and answer questions from our parents and caregivers! See below for the speakers and check out our downloadable program for their bios and other amazing resources!